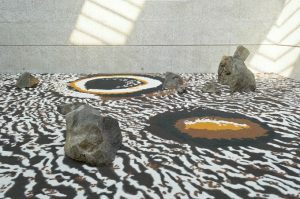 These local art institutions are two of only five in Orange County to be selected as part of the Getty Center’s “Pacific Standard Time: LA/LA” initiative. 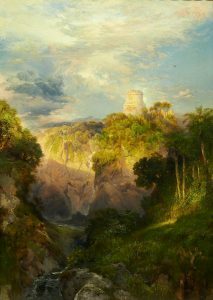 Revolving around Latin American and Latino art, more than 70 museums and cultural institutions plus over 60 galleries spanning from Los Angeles to Palm Springs and San Diego to Santa Barbara will take part in the Getty Center’s “Pacific Standard Time: LA/LA” initiative from September 2017 through January 2018. 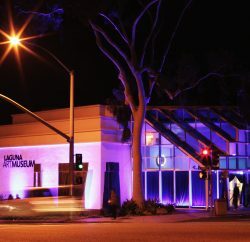 Two local institutions that will participate in this far-reaching project include Laguna Art Museum with both “California Mexicana: Missions to Murals, 1820-1930” and “Dan McCleary: Prints from Oaxaca,” and Laguna gallery saltfineart and Rawsalt with “Descendants and Dissonance: Cultural Iconography in Contemporary LA.” Not far away, the University of California, Irvine is also involved, presenting “Aztlán to Magulandia: The Journey of Chicano Artist Gilbert ‘Magu’ Luján” through Dec. 16 at its University Art Galleries. But this isn’t the museum’s only contribution to the initiative. 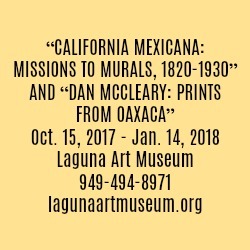 The Dan McCleary display features prints that the Los Angeles-based artist has created since 2000, on regular visits to Oaxaca, Mexico. 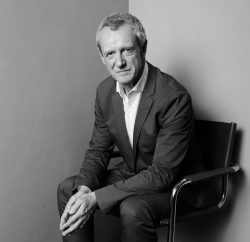 In addition to his Latin-influenced artwork, McCleary founded nonprofit organization Art Division, which provides visual art training for youth in LA. 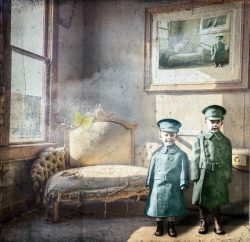 Laguna-based gallery saltfineart and Rawsalt will also be taking part in “Pacific Standard Time: LA/LA” with a showcase featuring works from Oscar Magallanes, Linda Vallejo and Sonia Romero, who visualize the mixing of iconography with culture and politics. 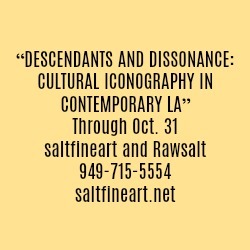 The exhibit, “Descendants and Dissonance: Cultural Iconography in Contemporary LA,” runs through Oct. 31. “The whole concept of ‘Descendants and Dissonance’ is the idea that … all three artists are of Mexican heritage and are very much inspired by the original Chicano movement of the [1960s and] 1970s,” says Suzanne Walsh, gallery director and a resident artist at Rawsalt. Magallanes’ artwork offers a chilling representation of how propaganda and corporate imperialism can affect individuals. The artist combines laser-cut wood and stenciling with video clips to create pieces that take the shape of stained glass windows, propaganda posters and 3-D wooden sculptures to illustrate life, death, creation and suppression. Also on display are pieces from Vallejo’s series “Make ’Em All Mexican,” which features gouache watercolor paintings of sacred geometry on round, handmade paper canvases. Her pieces reflect modern-day societal and political issues, and bear titles such as “52% of U.S. Latinos Experience Discrimination,” which includes color on only 52 percent of the paper. 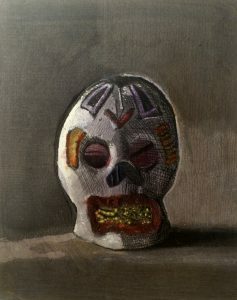 Romero uses traditional printmaking techniques to illuminate the effects of collective trauma. Her linocut prints feature collages arranged in piles filled with images of pop culture characters such as Cinderella and Bambi. 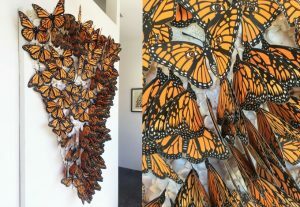 Another piece is an inverted pile of monarch butterflies that represent their migration from the U.S. to Mexico, where they typically arrive on the Day of the Dead and are believed to be ancestral spirits. Laguna resident Charity Oetgen’s watercolor paintings appeared in National Geographic Magazine.